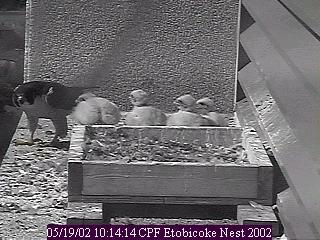 May 19th, 2002 -- Family snapshots such as this are becoming increasingly rare as the chicks begin exploring their home. Just a moment before, none of them were in view, as they had all wandered down to the other end of the ledge, under the camera. However, as soon as Angel landed by the nest tray, they all went running back, hopeful for a snack ... but on this occasion they were disappointed.